Consists of a resonance tube brass N.P. 100cms, reservoir brass N.P. 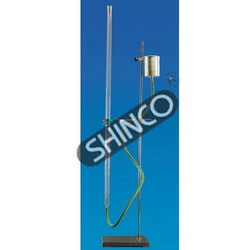 250ml & meter scale both sides millimeters, which are mounted on wooden polished board. The reservoir is caged in wooden block that has sliding & clamping arrangement on the board. The board is mounted vertically on heavy metal base with synthetic hammer finish with levelling screws. Complete with rubber tubing. Aluminium anodized 100cm resonance tube, brass N.P. Reservoir caged in wooden block having clamping arrangement slides on the board. The board is mounted on heavy iron base vertically with leveling screws. Our range is available at industry's most leading prices. Object: To observe the resonance phenomenon in an open ended cylindrical tube. To use the resonance to determine the velocity of sound in air at ordinary temperatures. Keeping track with the latest market development we are actively engaged in offering supreme quality Resonance Apparatus. Riding on unfathomable volumes of industrial expertise, we are manufacturing an excellent range of Resonance Apparatus. All metal fitted on heavy cast iron base with two leveling screws. Pipe dia 1 brass nickel led reservoir. 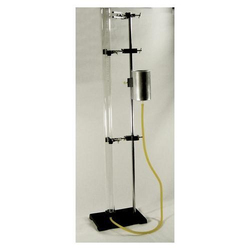 - Resonance Apparatus, Glass: A glass tube 340 x 25 mm mounted on retort stand with clamp & boss head, with 500 ml glass bulb, connecting tubing & spring clip supported on rubber covered split iron ring.